With the mission of making math education in Bengali enjoyable and more accessible from anywhere and anytime, hundreds of volunteers from One Degree Initiative Foundation (1di), a non-profit youth organisation embarked upon a quest of translating more than 900 mathematics videos from the renowned Khan Academy library. 1Di volunteers translated more than 900 Khan Academy videos. Khan Academy, an education based organisation renowned for its online resources that cover topics ranging from elementary maths to genetic evolution, is known as the free classroom of the world as incepted by the famous non-resident Bangladeshi and founder of the organisation Salman Khan. However, all the Khan Academy videos related to learning and education are available on the internet only in English, which can sometimes create a language barrier for the Bangladeshi students, who often happen to be unfamiliar with the critical mathematical terms used. As a solution to the problem, a team of energetic volunteers from 1di in collaboration with Khan Academy and also Agami (a US based non-profit organisation) came forward to translate more than 900 Khan Academy math-education videos, so that students from anywhere in Bangladesh can make use of most of these videos and can also get over the fear of math. The task involved the efforts of over 120 young volunteers from diverse backgrounds, who managed to get done with the pyramid task successfully within a span of only eight months. 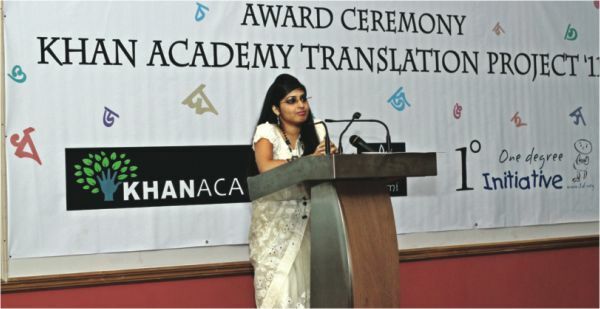 To celebrate the success of the magnanimous education-support project, 1di hosted an Award Conferring Ceremony for the volunteers of 'Khan Academy Translation Project 11' on April 10, 2012 at Hotel Lakeshore, Gulshan. Volunteers, who contributed greatly during different levels of the project such as video editing, commentary and human resource management, were awarded with certificates and crests. Famous author Dr Muhammed Zafar Iqbal send a video message to 1di. The award conferring ceremony was abuzz with the presence of special guests, well-wishers and most importantly, hundreds of young volunteers. Yeafesh Osman, state minister for Science, Information and Communication technology, encouraged the young volunteers to continue with their noble task to materialise the dream of digital Bangladesh. Though physically absent in the event, renowned author and also a youth icon, Dr Muhammed Zafar Iqbal appreciated the extraordinary efforts by the volunteers towards enriching the education spectrum of Bangladesh via video-message. Sabhanaz Rashid Diya, the founder of One Degree Initiative.